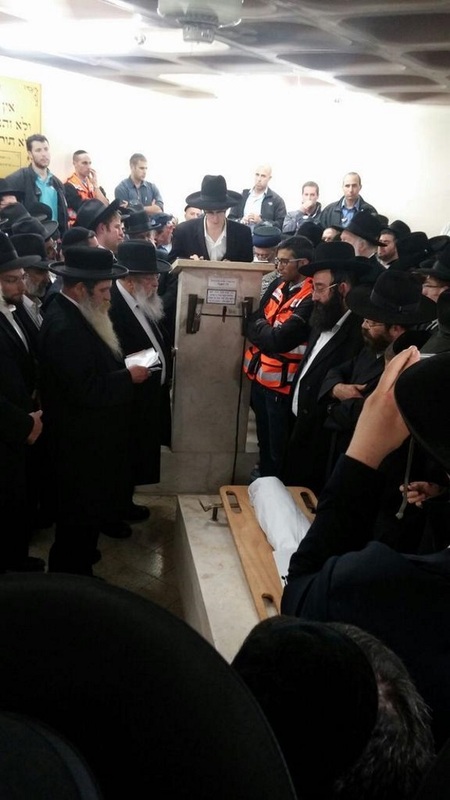 The funeral of 3-month old Chaya Zissel Braun, murdered by a Hamas terrorist (courtesy Isarel Hatzolah). Some years ago I was arrested by the Israeli police and charged with “incitement to revolution.” The grounds? I had reached the conclusion that it was impossible to find a solution for the Arab-Jewish confrontation in the Land of Israel (both the State of Israel and the lands liberated in 1967); that the Jewish state was inevitably headed toward a situation like that in Northern Ireland; that the only possible way to avoid or to mitigate it was the emigration of Arabs. Consequently, I had sent letters to several thousand Arabs offering them an opportunity (funds and visas) to emigrate voluntarily. The fact that many Arabs replied positively and that a major Arab village in the Galilee, Gush Halev, offered to move all its inhabitants to Canada in return for a village there did not prevent the worried Israeli government from arresting me. — Meir Kahane, They Must Go, 1981. Yesterday’s murderous attack in Jerusalem was carried out by a Hamas member, Abdel Rahman al-Shaludi, a resident of eastern Jerusalem, who deliberately drove his car into a crowd near a light rail station in Jerusalem. There are conflicting reports at this time about whether al-Shaludi is alive or dead. If he lives, he will receive the best trauma care in the Middle East, possibly the world, and then he will be imprisoned together with other Hamas terrorists where he will be able to take correspondence courses for college credit and receive visits from family members. His release may be demanded in return for future kidnapping victims. His victim was only 3 months old. She was thrown through the air and struck her head, dying at the hospital shortly after. Her parents and several others were also injured, but survived. All sides? Did she ask the police in Boston to “maintain calm” after the Marathon bombing? The subtext is that “all sides” are partly responsible for the conflict. No — only one side, the side that slaughtered Jews in Jerusalem in 1921, in Hevron in 1929, and has murdered thousands more since then is responsible, not ‘the occupation’ and not the fact that Jews bought some apartments in eastern Jerusalem. The President of Israel, Reuvin Rivlin, said “they do not distinguish between haredi and secular, settler and leftist, or a Jew in Israel or in the diaspora…” Of course he is correct, but if they did distinguish it would be irrelevant. “Settlers” are not deserving victims of terrorism. There has been an unreported plague of ‘misdemeanor terrorism’ going on in Judea and Samaria for years, which every once in a while gives birth to a murder or two. Now it has moved to Jerusalem, where it is harder to ignore. A Hamas spokesperson, Hossam Badran, said “this is a natural response to the crimes of the occupation and invasion of our land by the Jews.” I am not going to try to explain for the thousandth time why he is incorrect. I won’t convince him, nor will I convince his legions of ignorant fans, including many who are themselves Israeli Jews whom he would murder if he could. I also won’t won’t convince the logic-challenged ones who express horror at murders like this but still support the Palestinian Cause, like US President Obama and the Union for Reform Judaism. Probably it is not worth speculating whether things could have been different if we had made different choices, like not agreeing to the Oslo accords or keeping control of the Temple Mount in 1967. As my wife likes to say, it is what it is. No, my conclusion, the conclusion that I have finally come to after years of thinking that Jews and Arabs must find a way to get along, is this: There isn’t a way. Jews and Arabs cannot get along. Oh, individual Jews and Arabs can get along very well, but as peoples they can’t live together. I blame the Arabs for this, but it doesn’t matter. It is what it is. The Jewish state is non-negotiable, and so are its security requirements. So I ask seriously: was Kahane right? Update [1133 IDT]: Mahmoud Abbas’ Fatah faction (our Oslo peace partner) has already released a poster glorifying the ‘heroic’ baby-killer. 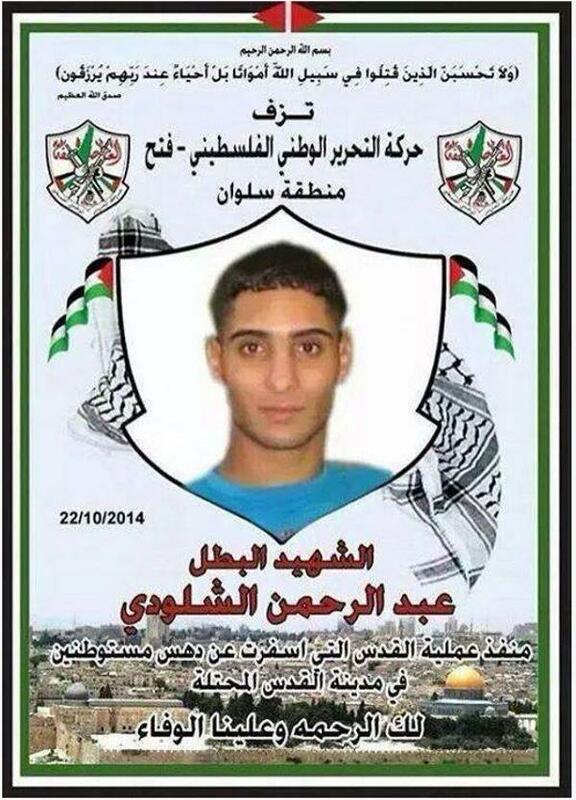 Fatah poster of ‘heroic’ baby killer al-Shaludi. This entry was posted in Israeli Arabs, Terrorism. Bookmark the permalink. 3 Responses to Was Kahane right? The fact the question has to be asked answers itself. What is increasingly clear is separation is not enough. An Israel with a Palestinian Arab state bordering it would still face the threat of hostile Arabs from without as well from within. Israel needs to break with this line of thinking, premised on the notion the two peoples can peacefully co-exist; Arab behavior demonstrates that is an exercise in futility and a pious hope unlikely to be ever realized. The Arabs need to persuaded or incentivized to leave the country. There is no alternative. Unless Israel looks forward to burying many more Chaya Zissel Brauns in the future. Meir Kahane was right. We cannot argue with reality or with the nature of his solution. If Israel wants to survive as a Jewish State, it must remove the power of the Arabs to harm it. They must as he wrote, go! What other choice is there? If Kahane meant that the Arabs will probably never really accept a Jewish state in the land of Israel then he is most probably right. If Kahane meant then we will probably not have true peace here for many years to come then he is probably right. If Kahane meant that we can solve the problem by paying all the Arabs to emigrate then I don’t believe he was realistic. Perhaps some would do so, but many would not. What this means in effect is that they are going to be here with us, making our lives more troublesome, difficult but also contributing to in one way or another the economy of Israel as a whole. I don’t think Kahane’s answer is a possible one. I do think however that a lot more needs to be done, and a lot more thought needs to given as to how to make the situation better than it is now. One obvious element is in finding a way to prevent the kind of treasonous behavior displayed by a number of Arab Knesset members. There are many other issues, including ones in which Israeli Jews are discriminated against because of special quotas made for Arabs in medical and law schools. Israeli Jews have to live now with a minority population which is over twenty percent of the general population. The uneasy situation between that very large minority and the Jewish majority is always going to be with us. This may not be the Jewish state we dreamed of and want, but it is the only Jewish state we have. Seeing pictures of yourself as a child, legs over the shoulder of your father, in some outdoor setting… your father is still vigorous in that picture, your mother may be sitting on a picnic blanket… you wonder if you can detect the future of what is now past in your expression. The grief one feels over that last picture of a child held up at the Kotel for a picture she should have mused over 25 years on, is indescribable. Start with the Jabotinskian idea that Jews must have their own purposes. Those must not be measured out in terms of past grievance–though grievance should bring foreknowledge–, nor shrunk from because others would restrain us–though we act not to give offense. Jews cannot live as if a certain number of us must die every once in a while to soothe the irrationality of lunatics, who make accessories of Israel’s enemies in the EU and US, before and after the fact. If this is the status quo, then all the terrorists and their clans must be moved out. It’s not merely to ask if Kahane was right or wrong, this is no way to live. As Victor Davis Hanson pointed out recently, over 10 million ethnic Germans were moved out of their homes and countries after World War II so that they could not serve as a remnant for the next madman’s excuse for conquering other lands (the tactic that Putin uses to great effect in Crimea and Ukraine today). That served the vengeance of the victims and paid the debt of failed conquest. It was not for the Jews to sue for peace to the endangerment of their country and people after defeating the Arabs in 1967. When babies are run over to advance madness, we have sued too hard to show restraint where none is required. Move them out by every incentive; force the bad ones out now; break every bad idea of our enemies on the wheel of our own purposes.